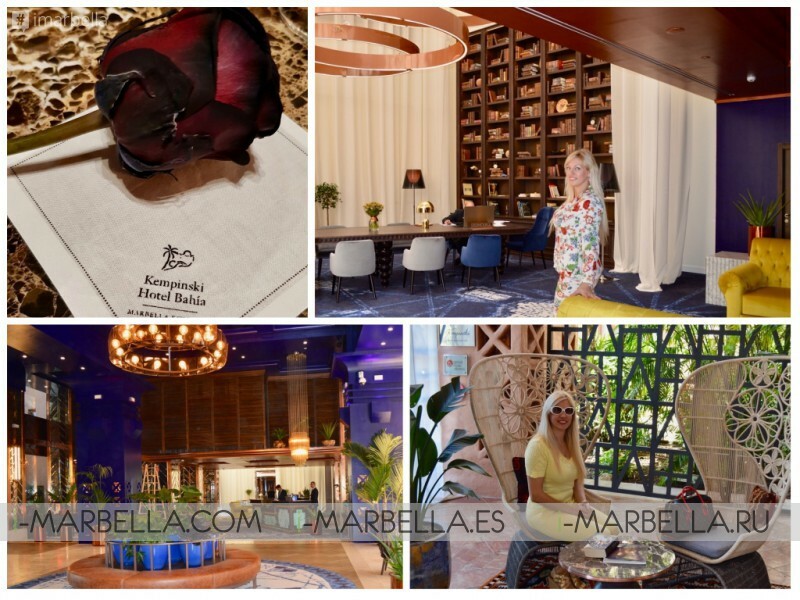 During my recent visit to Spain to attend the Costa del Sol Beach Polo Cup 2018 in its first edition, I was invited by Kempinski Hotel Bahia to experience their redesigned Hotel lobby, restaurant, and bar in Estepona, Spain. Kempinski Hotel Bahía has recently welcomed summer 2018 with a post opening after a beautiful redesign of the hotel lobby and public areas. 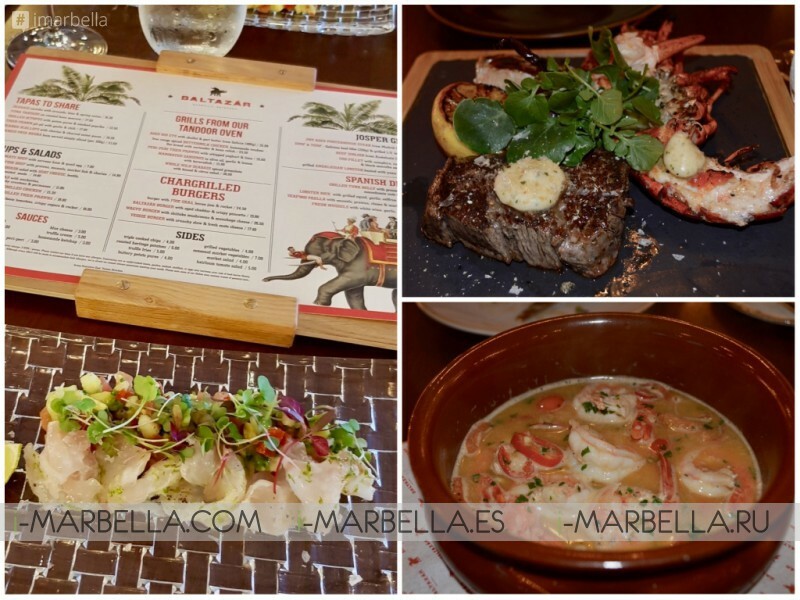 The hotel has also launched a collection of new restaurants under the name El Paseo del Mar. So I was invited to have my own experience of the new beautiful redesigned Hotel. Part of my experience has included; A spa treatment, enjoying the outstanding view from my room over the Mediterranean and the coast of Africa and Gibraltar, trying out the cocktails at the 'Black Rose The Bar', dinner at the newly Baltazár Bar & Grill, and finally the 'Costa del Sol beach Polo Cup weekend on the Playa Padron next to the hotel. The first thing you notice when arriving at the Hotel parking lot. They have a chandelier in the entrance that gives an essence of the very know old luxury Hotel environment. Once you enter the building you instantly feel and see elegance and luxury in every corner you put your attention. The lobby is spacious and outstanding it has many corners to explore. We've been hosted at the 'Grand Mediterranean Room' this room was incredibly beautiful with a direct overlooking the Mediterranean Sea, swimming pool, subtropical garden with terrace. The room itself was very posh, stylish and spacious with a sitting area and Nespresso coffee facility, a 'King Size' bed and an elegant marble bathroom with separate shower and bathtub with all the amenities. I really enjoyed and loved the room. The spa and gym have a separate way where you can go with a robe because it's close and I found it very convenient. Gym equipment and facilities are great. After the gym, you can also go to the Spa, where you can find different saunas, relaxing areas, and indoor pool. Breakfast at Kempinski Hotel Bahia is basically how a real 5-star luxury hotel breakfast should be - everything included; Egg center, hot buffet, meat, cheese, bread, fruits, cereals and a Cava in case you feel like starting your day drinking a little. The Kempinski Hotel Bahia is just next to the Laguna Village, which it's now connected with 'Paseo Maritimo'. It's very convenient for a walk, or jog along the beach plus you can find grocery stores nearby. Kempinski Hotel Bahía has launched a new gastronomy concept which it's called 'El Paseo del Mar' (Sea walk). El Paseo Del Mar is the new gourmet destination which combines three fantastic concepts all set within Kempinski Hotel Bahía - Baltazar Steak House, an upscale casual, funky and lively all-year-round grill-restaurant, Spiler Beach Club, a chill-out lounge, bar and restaurant that overlooks the Mediterranean, combining entertainment, dining, and music. The stunning new lobby is home to the Black Rose Bar, the perfect place to taste a cocktail and socialize with friends or hold a business meeting. El Paseo del Mar has been designed and created by the Zsidai Gastronomy Group in cooperation with Kempinski Hotel Bahía. Since we spent several nights during our stay we have enjoyed some of the cocktails that you can find at the redesigned new bar and lounge 'Black Rose The Bar'. This is the perfect place to relax and enjoy the spectacular sea views, socialize, have meetings and try specialty cocktails. The Barman was really talented, we ordered 'Pink Panther' that wasn't on the list and he did it and it was delicious. Also, I liked that the menu is very selective in regards to their own products with only Kempinski special cocktails. All the classic ones, you can also order and they will do certainly prepare it. Another thing that caught my attention was that on every table a black rose was placed which added a final elegant touch to my experience. Me and Veiko Huuse enjoyed also one night a romantic dinner at Baltazár Bar & Grill. This is a Spanish Steakhouse. The chefs use a handbuilt Josper oven or a Tandoor oven to cook the regional meat and fishes. Baltazár restaurant has a funky and cool interior with a view to the Kempinski Hotel Bahía’s beautiful pools and gardens. To share: SEABASS Ceviche with avocado, lime & spring onion, GRILLED OCTOPUS with potato puree & smoked paprika, SEARED SCALLOPS with chorizo & charred onion puree, TIGER PRAWN pil-pil with garlic & chili and BURRATA with heirloom tomatoes, crispy capers & rocket. For our drink, we had an exceptional Spanish red wine from Baltazár unique wine list which covers the whole country and the most iconic wine regions of the world with more than 150 titles. Our wine was chosen by the professional sommelier. I must say it was a perfect selection for our food. The food, in general, was excellent and I mean it! Every dish was exactly the way it should be, every dish offers you a gastronomic experience and was served with professional care and the exceptional wine by the sommelier. 2. Tiger prawn Pil-Pil – the new way to experience it no oil, this was surprising new in Spain and this way I love even more. 3. Surf & Turf Beef and Lobster – it was perfectly cooked and wine was the perfect match. 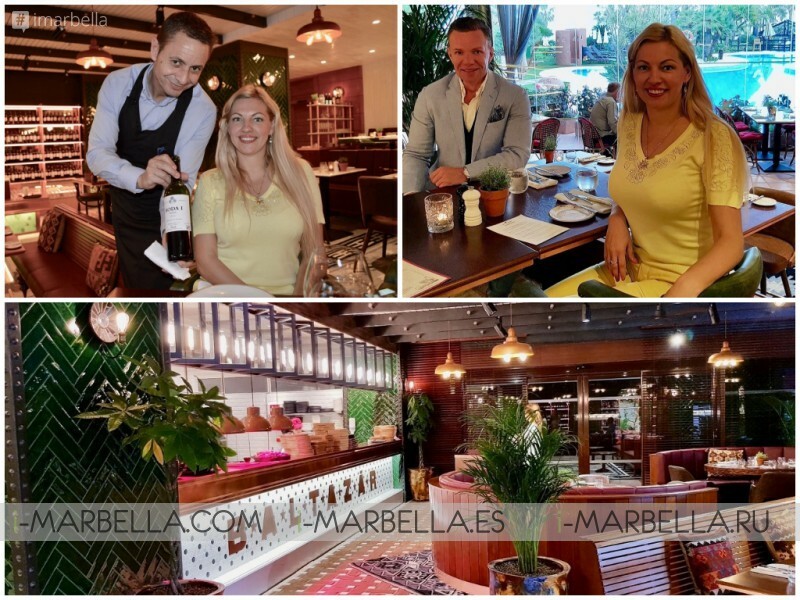 El Paseo del Mar is a new gastronomic hub located in the Kempinski Hotel Bahía Estepona, Costa del Sol, Spain. It's a hub with great food and exceptional service in a very cool, refined, upscale yet casual environment. This gourmet destination is a new addition to the Costa del Sol’s culinary niche, which will provide guests with a great value-for-money experience for every occasion. The Spa was incredibly good, it's cozier inside than outside. Trust me you'd love to go inside. You'll find the perfect treatment for you and why not allowing to pamper yourself with it? You will not regret it. it has very unique techniques for a spinal massage and to balance body energy. The final touch of the message was hot stones and face point massage to relax neck. This Kempinski Spa experience for me was beyond my own expectations. I highly recommend it to anyone. The receptionist was from Estonia so we had the chance to talk in Estonian and the therapist name was Claudia. We spent our long weekend at The Kempinski Hotel Bahía to experience first Costa del Sol Beach Polo Cup 2018 on the Playa Padron in front of the Hotel. It was a 2 days extraordinary Polo experience and one of the best I ever have had. On The beach, next to Marbella, horses, a polo game, well organized, VIP area, lot of champagne, good music, Afterparty, Glam Lunch, Awards Ceremony all included!. You can find out more information about Kempinski Hotel Bahía below. Don't forget to check the following articles where we talked about the winners of 'Costa del Sol Beach Polo Cup 2018' in its first edition and more details. Kempinski Hotel Bahía is located in the very heart of Andalucía on the Costa del Sol. Directly outside the unspoiled and traditional fishing village of Estepona, 20 minutes from Puerto Banús and Marbella. Kempinski Hotel Bahía enjoys a privileged front line beach position with incredible views out over the Mediterranean and the coast of Africa and Gibraltar. Surrounded by three outdoor pools and luscious subtropical gardens covering an extensive area of 40,000sq m the Hotel boasts 128 spacious rooms and 17 suites, as well a state of the art Spa offering serenity and a wide range of treatments and innovative products. The hotel was designed by one of the most reputed architects on the Costa del Sol; Melvin Villarroel. His exquisite taste is revealed through his design of the building as well as in the gardens, which have won the hotel several awards. A historical highlight located in the grounds is the ancient Almenara Tower where guests can enjoy a romantic dinner or a private group event as the sun sets out over the Mediterranean. Created in 1897, Kempinski Hotels is Europe’s oldest luxury hotel group. Kempinski’s rich heritage of impeccable personal service and superb hospitality is complemented by the exclusivity and individuality of its properties. Kempinski now manages a portfolio of 76 five-star hotels and residences in 32 countries and continues to add new properties in Europe, the Middle East, Africa, Asia and the Americas. Each one reflects the strength and success of the Kempinski brand without losing sight of its heritage. The portfolio comprises historic landmark properties, award-winning urban lifestyle hotels, outstanding resorts and prestigious residences. Each one is imbued with the quality guests have come to expect from Kempinski while embracing the cultural traditions of its location. Kempinski is a founding member of the Global Hotel Alliance (GHA), the world’s largest alliance of independent hotel brands. 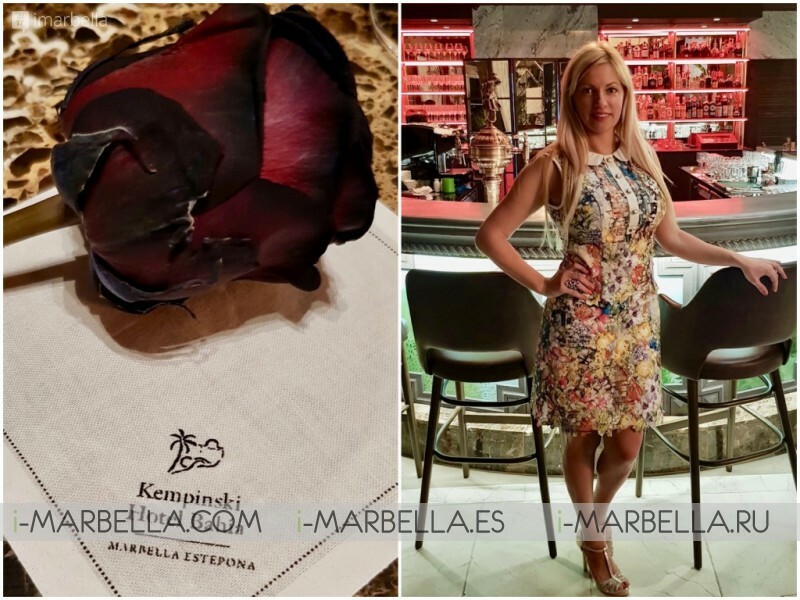 I'm a businesswoman, journalist, international influencer, blogger, public speaker, and the director of i-Marbella.com, and my job is to report emotional experiences and facts in the best possible way. Annika is a modern entrepreneur, a business lady of high standards and exquisite taste. Annika's incredible performance is best described by her numerous followers (more than 200,000.00 each month).